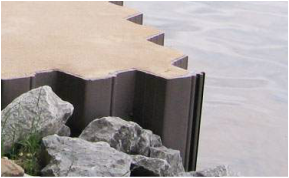 Shoreline Solutions has been in the marine construction business for nearly 30 years, selling vinyl sheet piling for nearly 25 of those years. 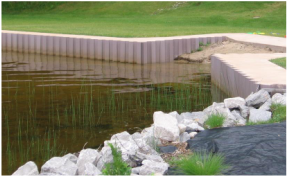 We are the very proud Michigan distributor of TIDEWALL vinyl sheet piling. TIDEWALL employs best-quality 100% window-grade UV stabilized PVC compound throughout, producing a highly affordable, UV-resistant, weatherable, aesthetically-pleasing, and impact-resistant product that retains its structural integrity. The sheets are designed to be thicker, deeper, and stronger to give added performance and structural strength. A beautiful maintenance-free TIDEWALL seawall will help protect your property investment. 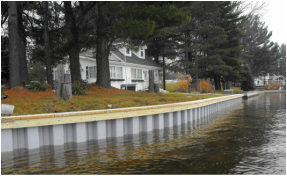 Shoreline Solutions can offer you Tidewall vinyl sheeting at unbeatable prices due to low overhead, bulk purchasing, and TIDEWALL's cost-effective vertical-integration manufacturing processes. We carry a large in-stock inventory in two colors - light gray and clay - in lengths ranging from 5 feet to 12 feet, along with universal corners. Other colors and profile series are available by special order. Please call for current in-stock availability. If we do not have your project needs in stock, we can either include it on our next semi load or have it custom-made and quickly delivered to your job site. TIDEWALL is manufactured by a very reputable and customer-dedicated manufacturer - Regenex. The founder and staff are commited to excellence and customer satisfaction. For further details and benefits including the manufacturing process, UV stability, engineering specifications, and warranty, we invite you to visit TIDEWALL. You can also download their very informative comprehensive brochure. Material availability, delivery, and installation of vinyl sheet piling. TIDEWALL vinyl comes in a variety of sizes and colors. See samples of our recent work with TIDEWALL products. Free estimates available. Call or email for low-cost pricing. Please include a contact number for a quicker reply. Delivery is available throughout Michigan.